UC Berkeley ethnic studies assistant professor Keith Feldman says that the United States and Israel both suffer from "racialized practices of threat production." Can an accurate analogy be drawn between American race relations and the Arab-Israeli conflict? 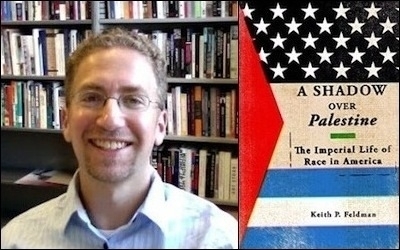 UC Berkeley ethnic studies assistant professor Keith Feldman advocates this particular "special relationship" in his 2015 book, A Shadow over Palestine: The Imperial Life of Race in America, the subject of a recent lecture sponsored by the University's Center for Race & Gender (CRG). CRG is home to the notoriously politicized Islamophobia Research & Documentation Project (IRDP) whose 2012 annual conference featured a jargon-riddled talk from Feldman. He was in similar form for CRG's September 24 Thursday Forum Series, which included "commentary" by Judith Butler, a UC Berkeley comparative literature professor best known for her virulent anti-Israel activism. Feldman, a fellow endorser of the U.S. Campaign for the Academic and Cultural Boycott of Israel, stood at the podium, while Butler was seated at a front table. An audience of approximately sixty comprised mostly of students filled the large classroom in Dwinelle Hall. Feldman's analogizing is jargon-laden, morally relativistic, and historically blind. Feldman, whose manner was humble and, at times, apologetic, began by thanking Butler for being his "interlocutor" and CRG for its "Islamophobia project," which he described as "unique globally" and a "community" that he had "been able to engage . . . in the construction of this book." This coupling . . . drew on material linkages to Israel as a military, economic, and geopolitical partner for the U.S. state to Zionism as a symbolic storehouse for the hegemonic articulation of liberal freedom and colonial violence. Accusing both nations of being warmongers, Feldman, ignoring the unrelenting Arab aggression at its root, pointed out that "Israel since 1948 [its founding] has been in a state of perpetual war," while the U.S. has been "animated by a seemingly permanent war making structure." He chalked both up to what he called the "racialized practices of threat production adhering in the enduring violence of white supremacy and settler sovereignty." American ghettos are like . . . Warsaws, Palestinian refugee camps, or like prison, or like occupied territory. Israeli sovereigns are like Western Europeans or American pioneers, while Palestinians are like African-Americans. . . . Jews are like white people or African-Americans. African-Americans are like Jews. If the audience had no idea what he was talking about, they did a good job of hiding it, as heads nodded and brows furrowed approvingly. In the early 1960s, race was already a well-developed heuristic through which the project of Palestinian liberation advanced its analysis of power and history. Although "U.S. imperialism" was a frequent target, Feldman omitted the Soviet Union's role in the Arab-Israeli conflict and particularly its influence in casting Israel and Jews as the oppressor and Palestinians as the oppressed in the popular imagination. This narrative of Israeli "settler-colonialism"—a term Feldman repeated ad nauseam—forms the basis for his own work and that of far too many of today's Middle East studies academics. Butler followed with a series of "questions" that, in reality, constituted a short, rather critical lecture. Although she described the book as "a gift and a provocation in many ways," she pointed out that by omitting Arab nations' "isolation" of the Palestinians, "Palestine is not given a regional existence." Butler also chided him for not consulting Arabic archives for his research, to which he responded lamely, "My Arabic is horrible." Afterwards, Feldman conceded that, "I'm realizing this might have been a conversation that I wanted to have when this [the book] was in manuscript form," which was met with laughter from the audience. Feldman's analogizing of African Americans and Palestinians draws more on 1960s radical ideology, buttressed by Soviet and contemporary anti-Israel propaganda, than on historical reality. A more rigorous and truthful effort to elucidate the plight of Palestinians today would call out the Arab states for their repeated wars on Israel, their failure to accept Palestinians as citizens, and the billions of dollars they spend to keep Palestinians in a state of constant upheaval and misery. Then again, a jargon-laden, morally relativistic, historically blind approach to a complex reality might be just the ticket to a position at an elite university.